The best meatless enchilada made with roasted sweet potatoes and peppers plus black beans all layered into enchiladas with homemade red enchilada sauce and cheese. I love meatless meals that you don’t even notice are meatless. 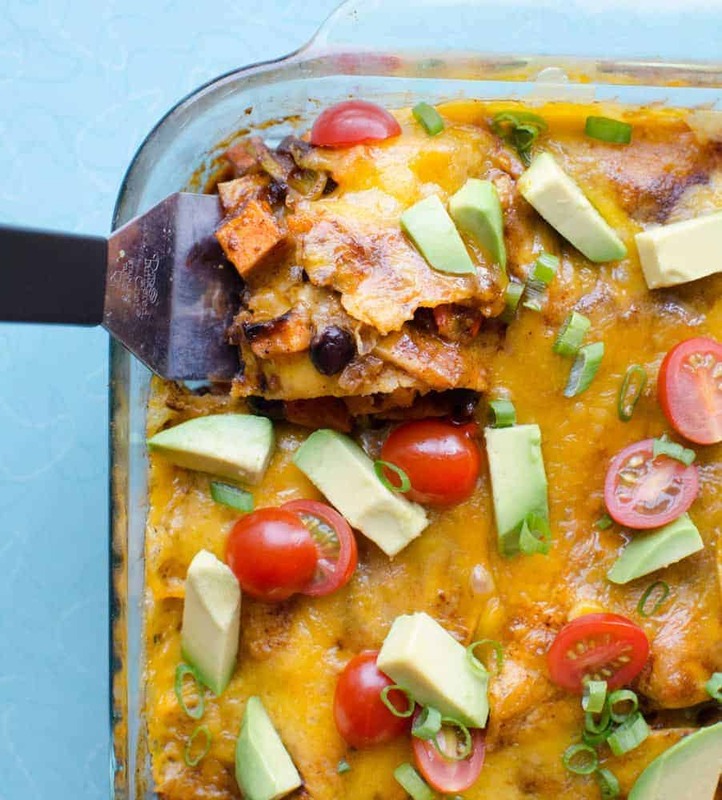 This Easy Black Bean and Sweet Potato Enchilada Bake is one of those meals. It has tons of flavor, color, texture, and cheese, so you won’t even miss the meat, and neither will your family. 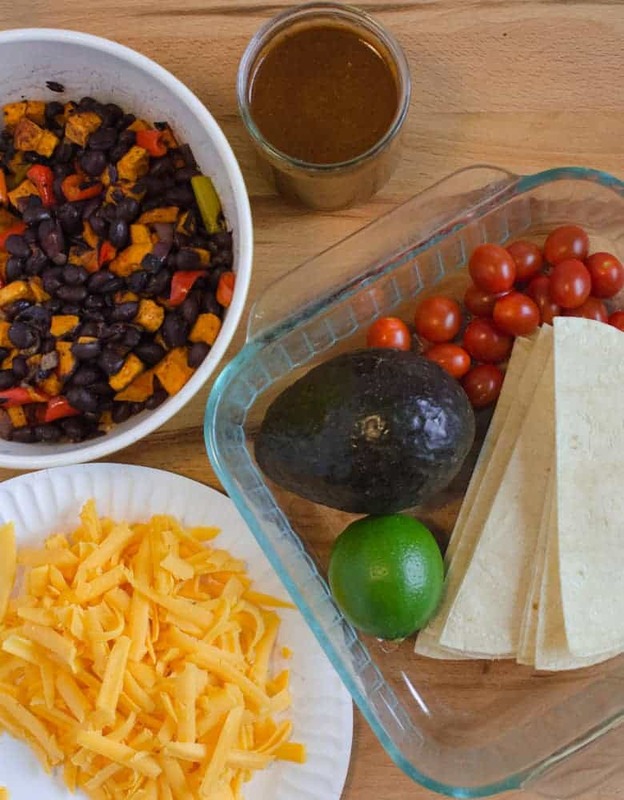 I think that sweet potatoes and black beans are one of my favorite savory pairs, and they go so very well together in this fun dish. I think the sweet creaminess of the sweet potatoes is perfect in a Tex-Mex kind of dish because it compliments all the heat and smokiness so well. You’ll love how easy this is to make, too. Instead of rolling a bunch of individual enchiladas, I just made this dish layered like a lasagna. Some people call this kind of thing “enchilada stack” or “layered enchiladas,” but no matter what you call it, it tastes greats and is easy, one of my favorite combinations. Roasting the sweet potatoes, onion, and bell peppers with spices and olive oil makes them soft, brings out more of their natural sweetness, and gives them a bit of smokiness, all of which is great in this enchilada bake. Make homemade red enchilada sauce to go with it. I love my homemade red enchilada sauce for a million reasons and I’d highly recommend trying it! One of the reasons I make enchiladas pretty seldom is because I never have the sauce! I started making homemade red enchilada sauce and homemade green enchilada sauce a few years ago, and I’ve never gone back. Both recipes are super simple to make and they freeze great, so make a double batch to have on hand for later. 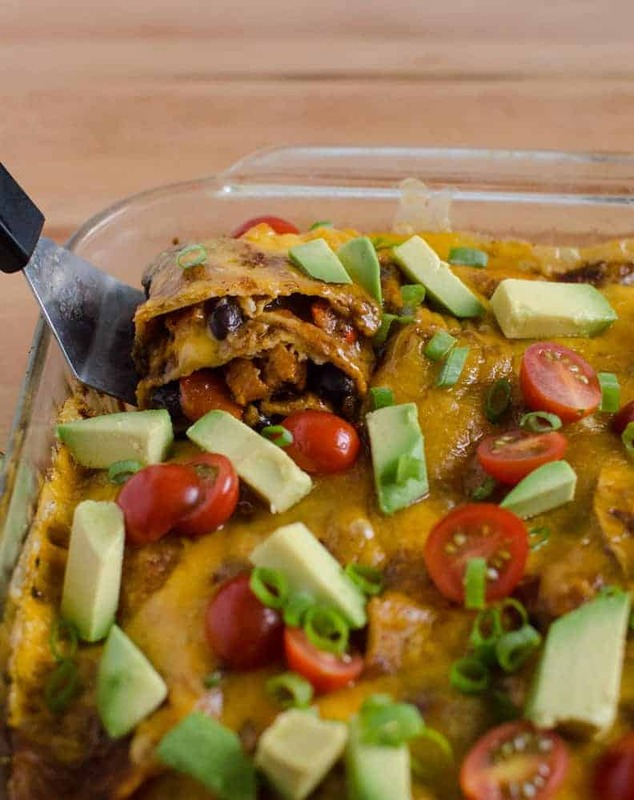 This easy Black Bean and Sweet Potato Enchilada Bake is easy to make gluten-free too. Just be sure to use a gluten-free flour blend in my amazing homemade red enchilada sauce and check the other ingredients to make sure they comply. This dish is great with some fresh sliced avocado, tomatoes, cilantro, and even a little sour cream on top. You can serve it with just about anything, but I’d highly recommend some fresh vegetables, lettuce, pico, or something along those lines on the side. You are going to love it! Craving more? Subscribe to Bless this Mess to get new recipes, meal plans, and a newsletter delivered straight to your inbox! 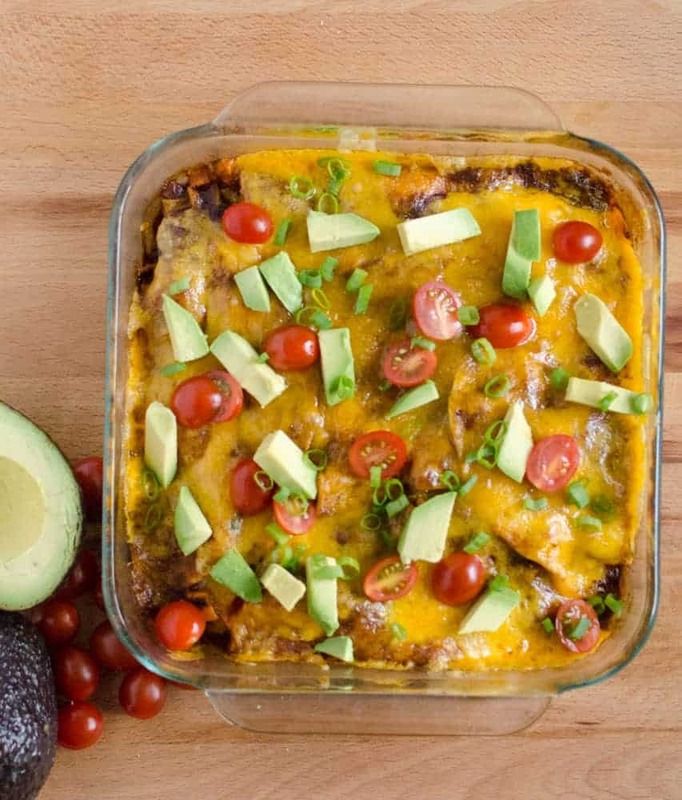 If you try this enchilada bake, let me know what you think! Leave a comment, pin it, and don’t forget to tag a picture #blessthismesseat on Instagram. I love to see your kitchen skills in action! That’s how I stack them up. 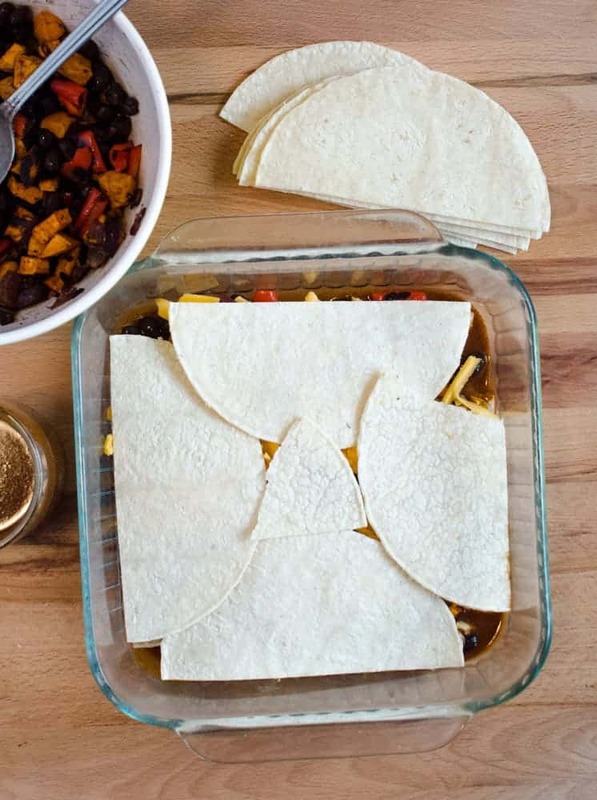 With a little tortilla tearing, you can cover the pan really well! 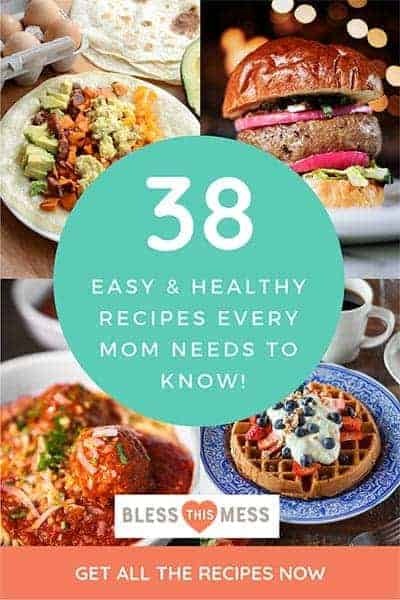 I’ve been working on a list of my favorite meatless meals, and I have quite a bit to make and share with you. What are YOUR favorite meatless meals? I was hoping to get some more inspiration from you! I’d love to hear what you feed your family on Meatless Monday. umm this looks amazing! I love black beans+sweet potatoes! We do it backwards, instead of meatless Monday it’s meatless most days and meat once in a while. Some of our favorites are: quiche with baked potatoes, homemade mac and cheese, beans and rice with toppings and corn chips (we call this taco salad, though I know it is not), zucchini parmesan/lasagna, bean burritos or tostadas, black bean burgers (that recipe from Ree Drummond you just shared on Facebook), veggie pizza, and once a week we have breakfast for dinner, usually Saturday and usually waffles (because dinnertime on Saturdays always sneaks up on me and it is super helpful to have an easy and fast standby). Hope that helps! I really prefer meatless meals most of the time, largely because I hate buying meat ;-). We make up for it with lots of eggs, beans, and dairy. Works for us! 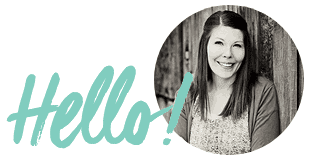 I would love to see more of your meatless specialties! This dish was amazing. Next time, I am using your homemade enchilada sauce! Thank you. You’re my favorite food blog! So I make this once a week and it is incredible!If I could post a pic I would (I’m perfecting it) thank you this is so amazingly delicious. This looks so good, Melissa! I love the sweet potatoes and black bean combo! Made it and loved it. I added about a cup of frozen corn and it was amazing. That sounds like such a great addition. I just made this this week, next time it’s in the rotation, I’m adding corn!